Although often not fatal to humans , the Red Lion Fish contains highly venomous dorsal spines which can induce extreme pain, and possibly headaches , vomiting and breathing difficulties when stung. 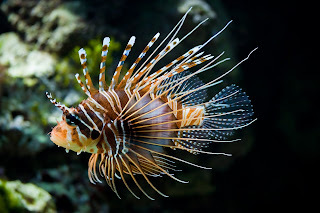 It is an invasive species in the Caribbean Sea and U.S .
Atlantic coastal waters, threatened native fish and the environment ; even capable of causing extinctions of native plants and animals by causing reduction in biodiversity and destruction of habitat.